On the plus side, I'm pretty sure Jesus never had shoulder pads. 16 As a result, the Jewish leaders were harassing Jesus, since he had done these things on the Sabbath. 17 Jesus replied, “My Father is still working and I am working too.” 18 For this reason the Jewish leaders wanted even more to kill him—not only because he was doing away with the Sabbath but also because he called God his own Father, thereby making himself equal with God. 19 Jesus responded to the Jewish leaders, “I assure you that the Son can’t do anything by himself except what he sees the Father doing. Whatever the Father does, the Son does likewise. 20 The Father loves the Son and shows him everything that he does. He will show him greater works than these so that you will marvel. 21 As the Father raises the dead and gives life, so too does the Son give life to whomever he wishes. 22 The Father doesn’t judge anyone, but he has given all judgment to the Son 23 so that everyone will honor the Son just as they honor the Father. Whoever doesn’t honor the Son doesn’t honor the Father who sent him. 24 “I assure you that whoever hears my word and believes in the one who sent me has eternal life and won’t come under judgment but has passed from death into life. 25 “I assure you that the time is coming—and is here!—when the dead will hear the voice of God’s Son, and those who hear it will live. 26Just as the Father has life in himself, so he has granted the Son to have life in himself. 27 He gives the Son authority to judge, because he is the Human One. [a] 28 Don’t be surprised by this, because the time is coming when all who are in their graves will hear his voice. 29Those who did good things will come out into the resurrection of life, and those who did wicked things into the resurrection of judgment. The word “judgment” leaves a bad taste in my mouth. I hear the word, and I instantly go on the defensive. I don’t think this is abnormal though. Who likes to be judged? It’s bad enough when we’re judged by our appearance, our words, our actions, and our apparent intelligence by everyone on else on the planet. As bad as that might get, at least we can deal. They’re judging us on human terms, with human perceptionsk even though Christ taught us not to in Matthew, 7:1-6: Don’t judge so that you won’t be judged. This problem belongs to everyone. That’s why Jesus told us not to do that. Take the log out of your own eye before you pluck the speck out of your neighbor’s. I might as well have a whole forest in my eyes, for all the times I judge other people. I can’t claim innocence in this. So what does it mean that Jesus is our judge? Jesus is the perfect one. Human and divine, fully human and fully God. Can you imagine if he didn’t love us? 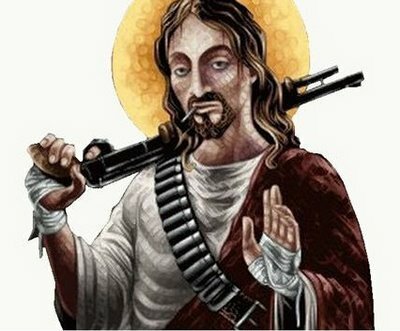 Could you imagine if Jesus was Judge Dredd? It probably wouldn’t be too pretty. Yeah, it would probably end like this. 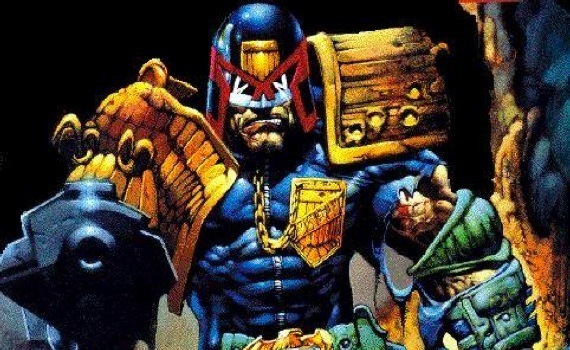 For those who don’t know, Judge Dredd was a comic book character that began in the 1979, and the basic premise was the Dirty Harry-style of rough justice cop. He was given the duty police, prosecutor, judge, jury, and executioner all in one, and he was vicious. One never saw his face, because justice has no face (SYLVESTER STALLONE DOES NOT COUNT). Was he lethal? Oh my, yes. His bodycount is probably in the upper thousands right now. Needless to say, Jesus is not Judge Dredd. But if there is fear that the judge may be too harsh, think about who your judge is. For the Father has given every judgement to Christ. Can Christ then condemn you when he redeemed you from death and offered himself on your behalf? Can he condemn you when he knows that your life is what was gained by his death? The penalty has already been paid, for those who believe. While Christ is judge, he’s also the paschal lamb. He gave his body and blood for us, and you think he would waste that by punishing those who he loves? No. I don’t believe that. I believe in Christ, and while there is justice and judgment, there is also grace for this poor sinner. I don’t deserve it, but he offers it anyway. That’s what waits for us on Easter: resurrection, redemption, and grace. Thanks be to God that that’s waiting for me. This entry was posted in Uncategorized and tagged grace, I AM THE LAW, Jesus, Judge Dredd, judgment, justice, Lent, Uncategorized. Bookmark the permalink.